In one succinct phrase, L. Frank Baum perfectly describes the feeling of suddenly finding yourself physically and emotionally lost. “I don’t think we’re in Kansas anymore,” Dorothy quipped to her dog Toto. When it comes to infidelity, regardless of the type this statement couldn't be more true. In Dorothy's mind mediocrity defined her life. Maybe you’ve felt like Dorothy…there was allegedly no color in her life. There was no excitement to be found in the prosaic little town in Kansas. The drudgery of life on the farm left her feeling hopelessly chained to a life of misery, drudgery and unfulfilled expectations. Didn’t she deserve to be happy? Didn’t she deserve to ‘feel alive’ with passion and the fulfillment of her every desire? Dorothy spent all her time longing for a better, more exciting life, and eventually found herself swept away by an ominous tornado that sent her helplessly spinning into a strange new land of fantasy. Unlike her old life, this new life was painted with vibrant colors and was full of song. She also found she was no longer alone; now a strange troop of friends entered her life: a scarecrow that lacked brains, a tin man missing his heart, and a lion with no courage. This motley crew committed to assisting young Dorothy and her dog Toto in her search for the Wizard of Oz. Oddly enough though, flying monkeys, wicked witches, and deception left Dorothy pining away for the very thing from which she had longed to escape. She just wanted to be home again where she felt safe and cared for. Is it possible the author of The Wonderful Wizard of Oz was writing about those trapped in affairs or addictions? How often do indiscretions begin with feelings of mediocrity, or a desire to feel alive, passionate and understood; seeking freedom from the constraints of a life we no longer want, pursuing the happiness we believe we deserve? And like Dorothy, the dissatisfaction prompting the search for better life sparks a tornado, devastating everything in its path. Catapulted into a strange new fantasyland, the individual is left to wrestle with what to do. Only now, they have to operate with the handicaps of Dorothy’s team: they have no brain, no heart, and no courage. My Spouse Has Lost Their Mind…. How do you decide what to do when somebody has lost his or her brain? If you've ever observed someone in an affair, it certainly seems they’ve lost their mind. I have seen successful men and women in extremely influential positions transformed into inept and incompetent individuals who seem incapable of making a rational decision. They become willing to jeopardize career, family, and future for this momentary pleasure. If the behavior of being “in love” were not socially acceptable, they would be certifiably insane. Everyone else can see they have no brain, and that reasoning and common sense are gone, but they refuse to hear the voice of any differing opinion about their actions, mindset or choices. The loss of heart is also apparent. There is an illusion that if one is in love, they are finally in touch with their heart, but with infidelity, they’ve actually just lost what little heart they had. The selfish pursuits of personal gratification and self-glorification have nothing to do with heart; rather they are based on self-centeredness. Like the tin man, the person involved in an affair lacks the ability to truly love. People with heart are actually able to feel what impact their actions have on those who are connected to them. They care about the pain they are inflicting upon those they love. Love compels them to act in the best interest of another person. The total lack of love for those injured by their betrayal is one of the most astounding aspects of an affair. The path out of this dark morass definitely requires that they acquire a heart, not only to grieve for those they’ve wounded, but also to learn how to truly love. Their response to their own choices and collateral damage they’ve created will actually reveal their love or lack thereof. Finally, courage isn’t a term used to describe those indulging in affairs. In fact, the act of betrayal highlights the lack of courage. Instead of exercising the courage necessary to admit what they’ve done and take responsibility for their choices, they hide behind a veil of secrecy, playing the victim and blaming others for their choices. Rather than having the courage to confront the deficits in their marriage while honoring their commitment even in hard times, they avoid difficulties of change, are afraid to face the consequences of their actions and fear releasing control because things might not turn out the way they want them. Ironically, it is this lack of courage that keeps them hopelessly trapped in the life they believe they need to escape. The only way to end the chaos is to let go. Unfortunately, because they lack the courage to let go and see what might happen, they remain immobilized, unable to face life's realities. responsibility for what they’ve done? The answer is simple - to do so creates immediate change, as well as a loss of control. It requires courage to actually take personal responsibility for their life and actions. Frequently, those lacking the courage to take responsibility will hide behind the justification and rationalization that they don't want to hurt their mate, claiming they are acting in their mate’s best interest by keeping quiet. In reality, they are controlling their mate by robbing them of the information necessary to make informed decisions and to address the issues in the marriage. It takes courage to be authentic in a marriage, but like the lion of Oz, courage is a trait that is sadly missing in those betraying their spouse. 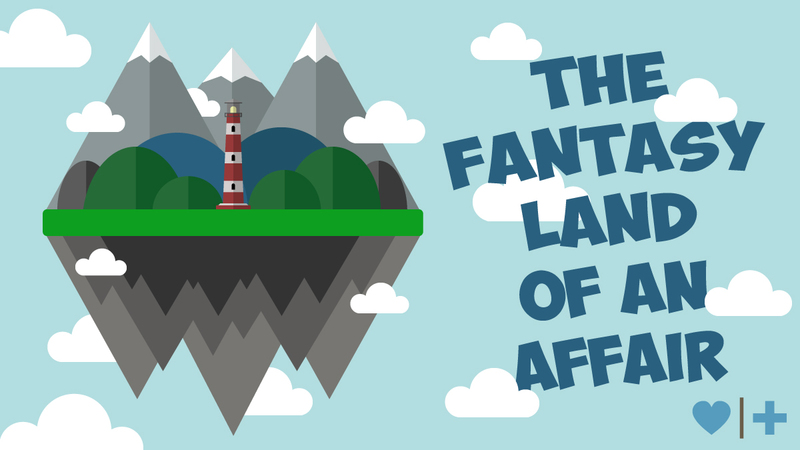 Interestingly, this trip to the fantasyland of an affair often culminates in a longing for home. Like Dorothy, betrayers often realize that “there's no place like home.” But how do they return? It would be nice if they could simply click their ruby-red heels together, but unfortunately infidelity creates a bigger mess than a physical tornado and requires a much more elaborate journey. The journey back is difficult and can seem to go in circles, but the destination is more exciting, and ultimately more rewarding than the fantasyland. It takes time and effort, but it is absolutely our best hope for growth and happiness. Come back to reality. Rediscover your brain, heart and courage, and you’ll find there truly is no place like home. If you believe there’s no way back I can tell you from experience that you are in fact, believing a lie. I’ve been doing this for over 33 years and I know thousands of couples who’ve found incredible healing in their marriage. It does however require the courage to take the first step. You don’t have to be fully committed; you just need to have the desire to explore the possibility of what can happen when you both receive expert care and a pathway to healing for your specific situation. If you’ve got even the slightest desire to find out if your marriage can be saved, take that first step: give our EMS Weekend a chance. You can hear compelling and true stories from those who’ve seen their marriage restored by going here. No matter what route you choose, at least do something. Start using your brain to see maybe you don’t know everything. Start using your heart to feel for those who are hurt and allow yourself to experience compassion. Finally, have the courage to take that first step and let go of control to see what could happen. This article was brilliant.Thank you so much!!! ...but when do we get to wake up and find out it was all a dream??? I'm waiting to wake up as well. I love these stories! It helps put things into the right perspective. THIS ARTICLE IS ABSOLUTELY PERFECT. MY HUSBAND IS HOME. THE JOURNEY HAS BEEN JUST AS DESCRIBED. NO WONDER I HAVE ALWAYS LOVED THAT MOVIE. LIFE COULD NOT BE BETTER ON THAN IT IS NOW ON THE OTHER SIDE OF ALL OF THIS. THANK YOU SO MUCH. Finally, a complete definition of what my unfaithful husband is and how he acted and still acts towards me. Thank you for this article, it has given me a boost to my extremely low level of hope that I am not insane, it is he who is the total problem. You see, he came to me broken, I was a good wife all throughout our marriage. I didn't say perfect, but a good wife. Even through it all, I have been faithful, lonely and longing to have that marital experience. Don't get why God choose to put me with him and be without...but he did. Thank you for putting into words the actions and feelings of the unfaithful. It brings to light a new understanding of how wrong we were and how truly selfish we have been! I am the betrayed and this explains everything perfectly. My husband is still involved and has moved out and is pursuing divorce. Not quickly, he filed 2 yrs later and 6 months after filing is pursuing it. I believe if he really wanted divorce, he would have completed it by now. Do I share this with him? Or do I leave it in Gods hands for him to see the light and try to fix out marriage and family? How does a person who has been selfish all their life change into someone who is compelled to act in the best interest of their mate? Were they "choosing" to be selfish? Did they consciously know it was wrong to be selfish? My husband has made major changes, he was a very selfish person and now he is very considerate towards me and our children. We were in counseling for almost 2 years and we did talk a lot about his selfish behaviors. I guess my question is if he has now learned how to not be a selfish person why could he not have learned it before the affair? Does it really take something as devistating as an affair to open their eyes? Do they really not have a brain or a heart before the affair? My ex-wife cheated on me and tried to completely destroy everything I value, my (idea of) family and my relationship with my children. I spent 9 months going through the grieving process and the last 9 months working on my co-dependency/caretaking issues (returning home so to speak). I was pretty shook up today when she had my 5 yr old tell me that it would be nice if "mommy and daddy" could see the kids everyday. I was pretty explicit a year and a half ago that what she did was trade half of her time with two children for an affair partner, and now when I'm starting to feel back in place she begins insinuating that she wants to come back (and completely confusing the children). I was confused most of the day, talking to a few people, "what do I do?" I realized, as I was reading this article, that I don't have to do anything. Or better yet, I can continue on my own path of healing. It's great that she's finally starting to see reality, but that does not mean I need to rescue her or even become wrapped up emotionally in her "fantasyland" (although I will address the problem of using the children as a sounding board). As I'm reaching the end of my journey through Oz, I'm beginning to value the lessons learned and see the story as a completion, rather than suffer through every challenge and emotion in the grieving process. Thank you for the article and I wish all of you strength and courage on your personal journeys! Excellent article. Best explanation yet of the affair fantasyland! Thank you for this.i am anxiously awaiting my first therapy appt since separating from my husband 3 months ago and discovering the woman he had an affair 4 yrs ago was not a woman from a bar but a coworker.and he took up with her again in the past year probably longer ,can't believe what he says.he didn't beg me this time to stay.neither of us are filing,but she is his best friend,that really hurts,and I can't give up on 18 yrs,especially when I worked so hard to blend our families and the 5 children are truly close and watch out for each other and our beautiful grandchildren.fantasyland says it all,but it seems more like adolescence ,especially with the other acting out behavior he's done and the heavy drinking.PTSD is part of it too with a series of events that put him over the top.im is a complete fog when my wonderful friends and family aren't around while he is enjoying the fantasy of it all. He did mention the affair might not be as great since the element of sneaking around has been eliminated except for the workplace, so it's still sneaking around if you asked me.i keep remembering the good man he tried so hard to be before the last 4 yrs.i only pray we,kids and I, see him heal, whether we get back together or not.thank you for all the newsletters. Ok Rick, thank you for that slap in the face back to reality. I've acted as the scarecrow with no brains. I've hurt a lot of people I love. I cannot thank you and your team enough for EMS weekend and all you have done indirectly to resuscitate me from this lying dreadful fog I was in. This article is the epitome of my situation. I've always wanted to be back home and that nightmare I lived is over. I am grateful for you all. But most of all, I am grateful for my wife. A Positively BRILLIANT Article! As the betrayer, the hardest thing ive ever done in my life was *letting go of my affair partner*. I did NOT want to do it. I was forced to do it. Insanely selfish right? And YES, I blame my partner (in part) for the horrid way he was treating me for years. It was a two way street. Was the affair "ok"? NO. Was it the right thing to do? NO. Facing the reality of a lifetime of bad marriage relating would have been much more appropriate, but I was so beat down in the marriage by that point (yes Im rationalizing here) that the lure of the affair was overwhelmingly powerful. Like a VORTEX... a Tornado. Its the weaker way to go. Of course, every affair is different. After nearly 2 years, I still feel justified in my actions. Im a horrid monster right? Most people just throw in the towel and get a divorce if their marriages are that bad. I had an affair. It was an alternative route, and ultimately it woke us both up, and FORCED us to fix our failing marriage. I wouldn't recommend it to anyone. The pain and brain damage it caused seemingly never ended. Best analogy I have ever read. The rebuilding after the tornado takes a very long time though......it is definitely not just a "heel click" away. I feel like I'm on the yellow brick treadmill. We were seemingly on the road to recovery and she had contact with her AP and then lied about it when I found out. That she would do that after watching the crumbled mess I'd become was difficult for me to wrap my head around. Who does that? I don't want to get divorced, mostly because of my children and the commitment I made before God. That said, I'm not at all connected to her anymore. I'm tired of talking about our relationship and whenever I bring up the affair, she brings up how awful our marriage was. It's like nails on a chalkboard, so I no longer bring things up (Triggers, etc...). For now, I focus on my kids and living my life for me. I am interested in reconnecting, but not really that interested in doing much to rekindle it. Maybe I'm the one without brains or courage? This is one of your best articles yet! As the betrayed, I watched my husband go through all of what you wrote about. Makes me want to watch The Wizard of Oz again with new eyes! Thanks for all your encouraging and informative emails! I wish there was a like button for the article and then one for the comments. All really great stuff! was fine with my marriage until my first love contacted me. We had been together all through high school and one year of college. He broke off our engagement 1 month before the wedding. I have been married 40 years,.. and did not know how powerful my love for my first love would be. I cannot not think of letting him go and never speaking or seeing him again.. It would be like saying I cannot talk or see my children, ever again. and There has been no sexual contact. The hooks are in deep,..